Moscato + Strawberry Lemonade = ANOTHER delicious summer drink! How about a glass of cold lemonade on one of those hot summer days? Lemonade is great whether you’re at a picnic, a backyard barbecue, sitting by the water, or out on a boat. Moscato, along with lemonade, combine to make a wonderfully refreshing summer-time drink. You can find all of our recipes on our recipes page. Make a simple syrup by combining the sugar with 1 cup of water in a saucepan. Place over medium heat and heat until the sugar is completely dissolved. Let cool. 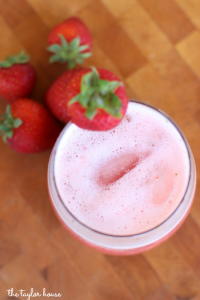 Once the simple syrup has cooled, puree strawberries in a blender. In a large pitcher, combine strawberry puree, simple syrup and lemon juice. Add 4 cups of Moscato Wine. You don't have to stop with strawberries! Try peaches, oranges, pineapples, whatever's in season!